Intrigued? I was, too. I can’t take credit for this lovely combination of ingredients. 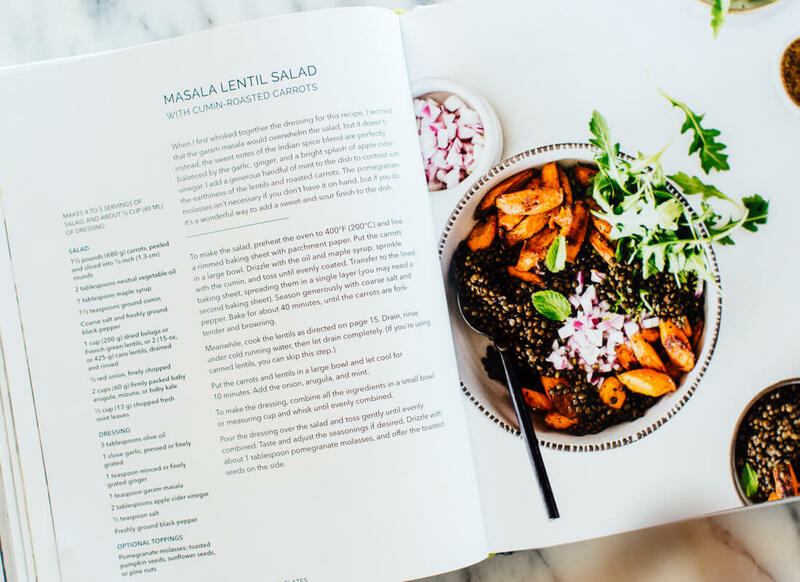 This masala lentil salad comes from Gena Hamshaw’s new vegan cookbook, Power Plates: 100 Nutritionally Balanced, One-Dish Vegan Meals. Perhaps you have come across Gena’s blog, The Full Helping, and come to appreciate her warm writing style and wholesome vegan recipes. If not, you’ve been missing out. 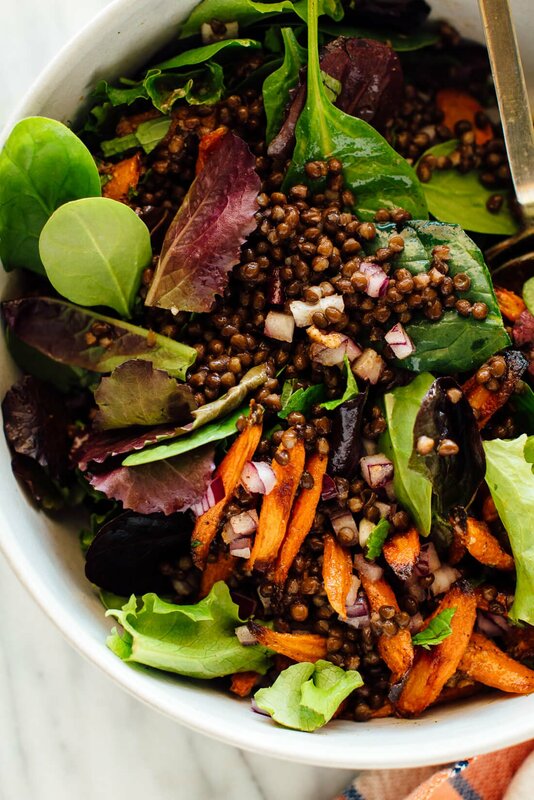 This salad combines tender roasted carrots, protein-rich lentils and fresh greens and mint with a garam masala-infused vinaigrette. Raw red onion contrasts beautifully in both color and flavor, and pumpkin or sunflower seeds offer some welcome crunch. I love sharing recipes from new cookbooks because it lets me share ideas I never would have come up with on my own. I wouldn’t have thought to add garam masala to a salad dressing, but it’s really nice. Noted, thanks Gena! My only change was using spring greens instead of arugula, since the store was out. (Isn’t that the worst?) I didn’t add Gena’s optional drizzle of pomegranate molasses, but I can see how a sweet-and-sour finish would make this salad even more delicious. 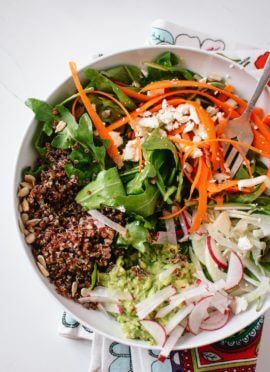 This salad is hearty enough to serve for dinner and keeps well for a couple of days, although you might want to store the vinaigrette separately to make sure the greens don’t wilt. This recipe is vegan, like all of the recipes in the book. 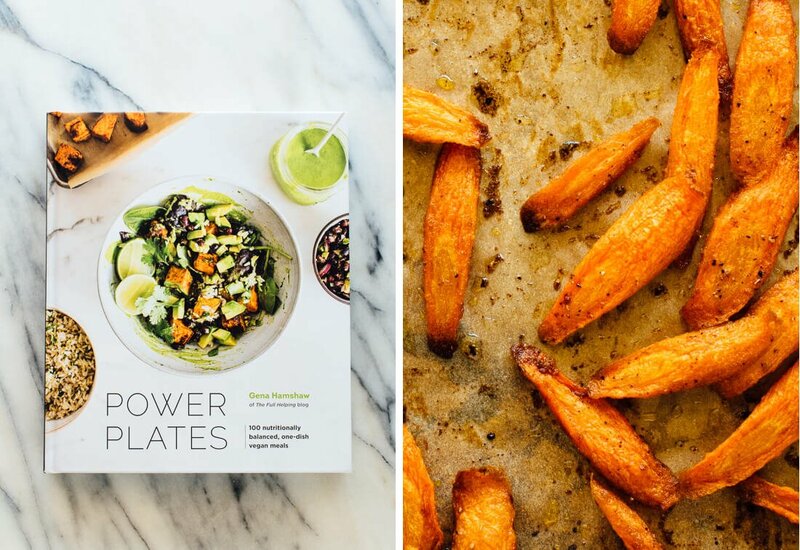 If you’re looking for wholesome, one-dish vegan or dairy free recipes, you’ll find lots of great recipes in Power Plates! Be sure to look for it in bookstores and let us know how you like the salad in the comments. 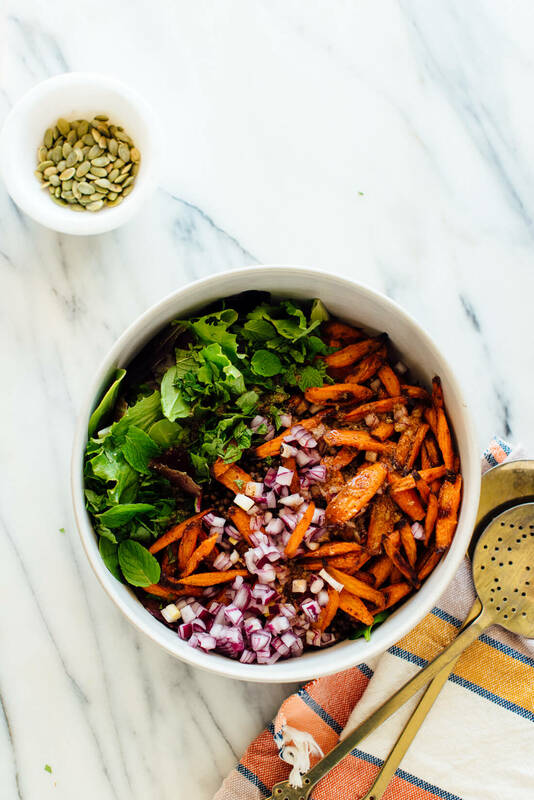 This striking salad combines tender roasted carrots, protein-rich lentils and fresh greens and mint with a garam masala-infused vinaigrette. This delicious, healthy vegan salad will fill you up! Recipe yields 4 servings. To make the salad, preheat the oven to 400 degrees Fahrenheit (200°C) and line a rimmed baking sheet with parchment paper. Put the carrots in a large bowl. Drizzle with the oil and maple syrup, sprinkle with the cumin, and toss until evenly coated. Transfer to the lined baking sheet, spreading them in a single layer. Season generously with coarse salt and pepper. 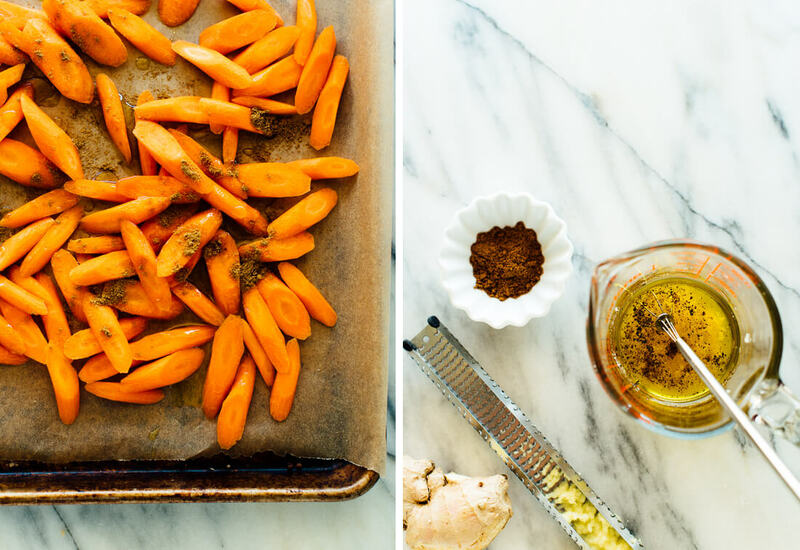 Bake for about 30 to 40 minutes, until the carrots are fork-tender and browning. Put the carrots and lentils in a large bowl and let them cool for 10 minutes. Add the onion, arugula, and mint. 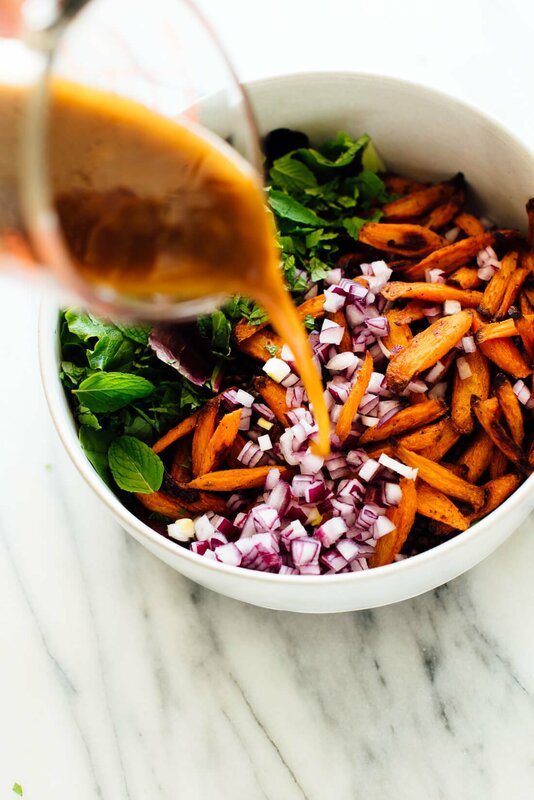 Pour the dressing over the salad and toss gently until evenly combined. Taste and adjust the seasonings if desired. Drizzle with about 1 tablespoon pomegranate molasses, if using, and offer toasted seeds on the side. Storage suggestions: This salad keeps well, covered and refrigerated, for up to 3 days. Hi Jana, I am working to get that fixed! I’m not planning to get rid of it :) I’m sorry for the inconvenience! This one is for the books! Love to hear what you think, Gaby! This sounds so yummy! I would like to try it as listed but my husband doesn’t like mint…what else can I use? Hi Linda – You could leave out altogether. Or use cilantro instead. Let me know what you think, Deborah! I just made this recipe today. It’s soo delicious Instead of carrots I used sweet potatoes. Thanks Kate! I gotta be honest.. this is the first recipe in a while that really made me sit up and look at it…. I am gonna try this…the sweet from the maple syrup combined with the peppery arugala and the toasted sunflower seeds…. added in the garam masala….I’m curious… on paper this looks flippin amazing!!! She knows what she is doing! It’s stunning and delicious. Thanks for trying it, Dawn! To die for! This will be made very, very regularly. I love it! Thanks for sharing, Liz. I really need to make this soon. 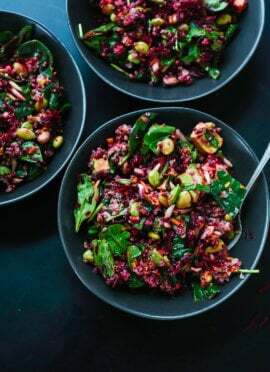 With all the spices and the vegetables you have added it seems like such a colorful and flavorful salad. And like love the taste of garam masala in food since it really brings out the flavor. It’s delicious! Let me know what you think when you give it a try. I’m a big fan. Have your cookbook. This was fabulous. A real food keeper! Used pomegranate molasses- very good. Made next night w roasted broccoli and Brussel sprouts but not nearly as good as w carrots. Had all these lentils w little experience w them. Glad to put them to good use. Even carnivorous hubby loves! This is huge! Many thanks! We made this recipe and loved it! The tastes all come together very well. We used spinach instead of arugula or kale, and substituted agave for the maple syrup. Will definitely make this again! The nutrition information isn’t working in some browser versions, but I love that feature when it works! This is delicious! Loved the garam masala flavor in the dressing. Used arugula, and made recipe as-is. Loved everything about this. Will be making again soon! Whoa ! this is a great recipe! I made it tonight and I am looking forward to having the leftover this week. I love that Kate only publishes recipes that use items you can pretty much find in your pantry . I know! Me too. Thanks for the review. This tasted great and is very good for you. I didn’t have pomegranate molasses either but used some regular. The pumpkin seeds were a great idea and I have no problems with garam masala myself and had plenty to use up since many recipes don’t call for it. Thank you, Heather for the review! I made this for my lunch salads this week – super unique flavors here! I really like the garam masala dressing. Thanks Kate! You’re welcome! What a great lunch, Breanne. Such a beautiful salad and a welcome combination of exciting, new flavors for my tired salad rotation! I didn’t have lentils so I used quinoa instead and added some dried cranberries and toasted almonds, which gave it some moroccan-inspired vibes. Thank you for featuring Gena’s recipe! Her recipes (and yours, of course) always inspire me to get in the kitchen even after long days, and her writing is often poignant and personal, which I love. Thank you both for your thoughtful writing and reliably-amazing recipes! Well, thank you Rana! I’m happy to hear you are familiar with Gena’s recipes already. It’s a great cookbook! This looks really delicious. I love salads. a few weeks ago you featured a thai soup, from a new cookbook you recommended, Power Plates, which i immediately bought. thank you. However i can”t seem to find that great soup recipe. it’s not in that book, or yours, which i also own. Do you remember the name of the soup, Jane? You can always search for the recipe in search bar of the blog if you think it is from there. Love this. It is great both with and even without the greens. It would be fun to swap in other veggies for the carrots — brussels sprouts maybe. (This is not a criticism — I am genetically incapable of not riffing recipes.) Clear part of my rotation going forward. Thanks and pats to Cookie. You’re welcome, Jean! Thanks for your comment and review. This is delicious. I added the onion and dressing to the hot lentils & hot carrots. Then when I served it with the arugula and mint I gave it a squeeze of lemon juice, splash of red wine vinegar and a drizzle of olive oil. I absolutely LOVE this recipe and made it yesterday(Sunday). Any chance I could use it for a special meal I’m preparing on Thursday? Do you ever get an extra day out of it? My schedule is too busy to make it on a weekeday. Thanks!! Sure! Just wait to combine all the ingredients, especially the lettuce. That will allow you to get more days out of it. I hope this helps! This is perfect dinner for the nights I work late! I made the lentils and the carrots in the morning and combined them in one bowl in the fridge. I put the greens in a separate bowl (I forgot the red onion but it was still yummy!! – will add it next time for sure!). Then I made the dressing in a small jar. Dinner was on the table minutes after I got home. Greens were topped with the lentil carrot combo, I shook the jar up really well and poured it on top of the salad. I divided the salad between our two plates and we both loved it!! Thanks for this great make-ahead recipe! Thanks for the comment and review, Suzy! I appreciate it. This was amazing! We added cucumbers to the salad and a little maple syrup to the dressing. All three girls loved it. Thanks! I’m happy you tried it, Weslei! I fixed this salad for a Fathers Day picnic at the local air show. I was able to fix it the day before, and added the arugula the next morning. By afternoon, it was perfect. The dressing is balanced–not too much acid from the vinegar, and the mint was not over-powering. Usually, I can think of something to make a recipe more to my taste. This time, I wouldn’t change a thing. My parents loved it and have requested that I bring it over for family potlucks some time. Even my husband loved it. I’m having the last little bit of it for lunch this afternoon. Thanks for the recipe. Wonderful! Thanks for sharing, Dorcas. I just made this salad and it was delicious! 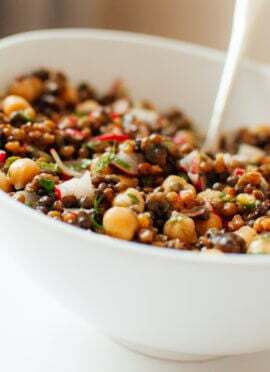 A nice alternative way to use lentils. I find a lot of lentil recipes feel heavy and prefer them for winter, but that was not the case with this one. This salad was fresh and light. Also kept well for lunch the next day. Thanks for sharing, Chili! I appreciate the review. Delicious! Thank you, Lindsey for your comment and review. Fantastic, such a great example of how good vegan can be including the colors and textures. My daughter and I dined at the beach for this one. Excellent! Thanks for sharing. The mint/cumin/garam masala combination give this such a fabulously complex flavor. Made this as a side with mint pesto meatballs and it really worked well. Your recipes are always wonderful! Pretty Good. Can’t wait for your new recipes. Thank you! Sign-up for the newsletter, if you haven’t already. You can stay up-to-date on all things new. I made this yesterday for my son and daughter-in-law who were in the Mother Baby Center with their first! It’s such a good recipe, loved it! I went very light on the spice because she’s nursing, then served it with Naan and hummus on the side, which went super well with the salad. My daughter-in-law wanted something healthy with protein, so that salad seemed to fit the bill. This was my second Cookie and Kate recipe, a winner for sure, thanks! I’m happy to hear you liked it! Thanks for your review. This was delicious! I didn’t have enough carrots so I added a sweet potato. The dressing is perfect! Awesome! My go to salad now. I made a derivation of this salad due to forgotten items at the grocery store. I used spinach, the roasted carrots, caramelized onions, goat cheese, and pepitas with the dressing. Still good! Eating this right now, and it is fabulous. I used canned lentils, so it took no time at all to make. Perfect! This was so good! I didn’t add any mint but it still tasted amazing. I threw all the dressing ingredients into a jar and shook it and it emulsified beautifully. Forgot to mention I roasted the red onion along with the carrots because I don’t like raw onion – turned out great! And I omitted the maple syrup and pomegranate molasses because I don’t have a sweet tooth; the carrots and roasted onion made the dish sweet enough! I’m glad you liked it! Thanks for sharing, Z.
FABULOUS recipe. Have served it at a number of dinner parties, large and small and I don’t remember having so many requests for the recipe. Moreover, it saves nicely in the frig afterwards for leftovers. Thank you, Rebecca! Glad you love the leftovers. The masala dressing is delicious and adds a unique flavor! Good as leftovers as well. Oh, wow! Such wonderful flavors! I accidentally minced 1 Tablespoon of ginger root, but that worked out great too. I also used scallions instead of red onions because red onions give me a tummy ache. So, so delicious! Thank you! I’m not a fan of red lentils as they don’t seem to hold up as well or depth of flavor. If you use them, make sure you follow the cooking instructions on package as they don’t usually need as long. Thank you. Thought that is what I had on hand but turns out it’s a medley of brown, green, and black so hope that works! Just made this salad for dinner (I’m on a salad spree after making the roasted broccoli one earlier since I needed to use up a bunch of arugula) and it was awesome! I love the combo of the garlic, ginger and garam masala with the mint in the salad. It was also a hit with my husband. Thanks for this great recipe! This is truly a stunning combination that I never would have thought to put together. This sounds so good! Where on earth do I find pomegranate molasses? Is it available in Canada? Just found a recipe to make the pomegranate molasses. Simple!